15 degrees, lists, solving problems and giving thanks, the week that was with pie as far as the eye can see. While getting ready for work Friday morning, Nathalie laughed and pointed out that there is such a difference between 15 degrees in October and 15 in April. I said one represents the beginning and the other the end. In this example, the end is what we want, the anticipation and not the despair. But, alas that is where we find ourselves. 15 degrees and it’s gonna’ get a lot worse, before it gets better. It’s not that it is only weeks away from snow flying around that get’s me, it’s the fact that I just wish we had a few more weeks of the warmth. The other morning I awoke early, as I have done a bunch of times over the last little bit, coming up with solutions to some of the world’s big problems. I only wish I had the smarts to write down some of the ideas, because I am sure some of it was good. In my, unable to go back to sleep haze, this week, I remember I was thinking about top 5 lists. I know, random. I was thinking for example, if I were to come up with a list of my top 5 date nights with Nathalie, would she come up with any of the same? I am sure that night we first met would be in there, and maybe the wedding or the night we got engaged, but who knows. So, I wondered if our lists where indeed different is that a big deal? I came to the conclusion after much self-debate, that I would think not. After all perspective is what makes us all different and even in two people reliving the same event, would likely look different from each of their positions. This is the one-day a year (in Canada anyway), when we all talk about giving thanks. Counting our blessings and taking a moment to reflect on what we have and don’t have. I don’t have pie this year, but I am still prepared to mark time with a few things I am thankful for. As always, I am very thankful for my wonderful family. I am thankful to have a job that I love, and that for the most part, I think I am good at. I am thankful for a circle of friends, that each bring something different and unique to the table. I try so very hard, each and everyday to be thankful for the wonderful life I have, but like anything, probably don’t look at the positive side of things enough. It is easy to fall into the, “grass is always greener” type of thinking, in the day-to-day minutiae. So, I guess it’s good that we have this one-day that everyone is reminded to give thanks. So, if you are in my life, or even just outside looking in, thank you very much for just being you! We had a couple of meetings with Jordyn’s teachers this week, as part of the annual, parent teacher interviews and I am always so proud when I hear the teachers talk about how wonderful of a student she is. She tries hard and asks questions in class and it would seem is progressing well toward her academic goals. This is very early on in the school year, so they each couldn’t offer too much insight, but they all sure like her, and for that alone, we are very proud. A few weeks ago, our printer was out of ink and so I picked up the two replacements cartridges from Wal-Mart, after Julia reminded me (several times). She had some pictures on her phone and Instagram account she wanted to print. Tax in, around a $57 investment in making Buglia happy, was of course worth it, but I did complain about it in the moment. I complained even louder after printing, what seemed like an endless list of snapshots for my 12 year old artist. When I got to bed that night, I found a note beside my bed from Julia, with a 5-dollar bill and some loose change attached to it. It said, “I am sorry about the ink, please take this money. I will pay you more later”. Well this week, I discovered what it is she actually did with all these pictures. 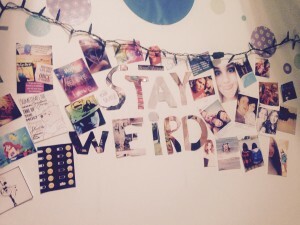 Above her bed is the most amazing artful collage of images all centered around the caption “Stay Weird”. This homage to her life, with pictures of each of her friends, the movies she likes, the music she listens to is an inspiration. I asked her, “Do you think you are weird?” She said, “Yes… but not weird as in strange… weird as in not plain or normal!” And that you just have to love! Off to find some not normal pie!